Episode 33 of the Khandaan podcast brings you one of our favorite movies, 2007’s Om Shanti Om. Directed by Farah Khan, this Shahrukh Khan-starrer was also Deepika Padukone’s debut film. Co-starring (Chowkidar) Kirron Kher as Maa, Shreyas Talpade as Friend, and all of Bollywood as backup, OSO is an homage to Hindi film. It should surprise nobody that co-hosts Asim, Amrita, and Sujoy love this film. Welcome to Episode 24 of the Khandaan podcast. Today we’re joined by Jay Mamtora, founder of BollyBrit, one of the last few outposts of independent Bolly-focused media on the internet. Join us as we discuss 2014’s Farah Khan-directed glitzy spectacular (?) 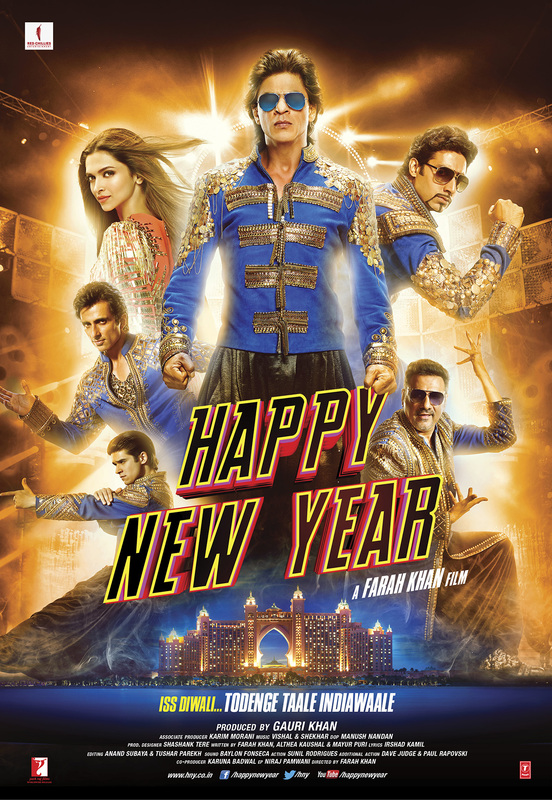 Happy New Year, starring Shahrukh Khan, Deepika Padukone, Boman Irani, Abhishek Bachchan, Sonu Sood, and Vivaan Shah with Jackie Shroff and Anupam Kher as supporting cast. A heist movie that also tries to be a revenge saga, a romance, a buddy movie, a dance competition movie, and a masala entertainer with nationalist underpinnings, it’s a bit of a mess. We also discuss current Bollywood happenings – from the spate of weddings (Anushka! Sonam! Deepika! Priyanka!) and their gossip quotient, to all the new films coming out. Watch out for our extended debates on Simmba, Kedarnath, 2.0, and more. And finally, just a reminder that we’re back to old and tested ways and you should vote for our next movie here. In Episode 15 of the Khandaan Podcast, we switch up our format for a special series: over the next few episodes, we will discuss movies nominated by our audience as their all-time favorites. We begin with 1992’s Jo Jeeta Wohi Sikandar. Starring Aamir Khan, this was the second film made by cousins Aamir and Mansoor Khan, co-starring Ayesha Jhulka, Dipak Tijori, Pooja Bedi, and the always reliable Khulbhushan Kharbanda among others. We also discuss the brand-new release Sanju, the whitewash special directed by Raju Hirani starring an eerily excellent Ranbir Kapoor, who rebounds in style from a couple of years of less-than-successful films. Co-starring Sonam Kapoor, Vicky Kaushal, Paresh Rawal, Manisha Koirala, Karishma Tanna, Anushka Sharma, and Dia Mirza, this movie should have been a knockout but sadly isn’t. Lastly, we look at Sacred Games, the first Indian original commissioned by Netflix. Starring Saif Ali Khan and Nawazuddin Siddiqui in the lead, ably supported by a large cast of pitch perfect actors (including Kubra Sait, Radhika Apte, Neeraj Kabi, Jitendra Joshi and others), it’s based on the Vikram Chandra novel and adapted to screen by Varun Grover, Smita Singh (not Bansal as Amrita says in the podcast, sorry), and Vasant Nath. Co-directed by Vikramaditya Motwane and Anurag Kashyap, this series sparked quite a bit of conversation. Subscribers are reminded that Khandaan is currently accepting nominations for our special run. 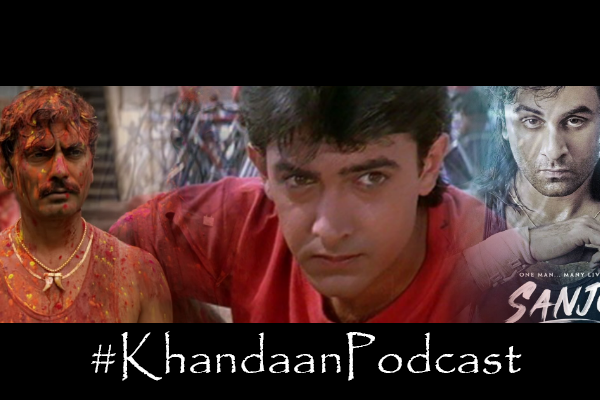 Please send your suggestions for movies of the Khans that you feel we must watch to upodcasting@gmail.com. Note: The Khandaan podcast is an interactive experience! Please click below to vote for the next movie you think we should feature. For episode 16, we have Shah Rukh Khan’s early era. Welcome to Episode 12 of the Khandaan Podcast! This week we’re discussing 2006’s Jaan-e-Mann, starring Salman Khan, Akshay Kumar, and Preity Zinta. While JEM has gained a bit of a cult following in the years since its release, it was a disastrous flop when it came out. An uneasy marriage between troubling Bollywood stereotypes and a whimsical ode to classic Hollywood musicals, JEM is by turns fantastic and repulsive. Asim, Sujoy and Amrita have plenty to discuss when it comes to the themes of the film, its reception, the stars, the makers and its place in Bollywood history. Meanwhile, we discuss a few housekeeping items of interest to our loyal listeners and discuss a few current events such as the reactions to the Race 3 trailer, Salman Khan’s increasingly visible disinterest in song-and-dance routines, and a trio of remarkable interviews: one in which Madhuri Dixit can barely hide her disdain for Rajeev Masand; and two in which Anupama Chopra skillfully drew out Madhuri and Bobby Deol, who dominated the chatter cycle this week with a highly emotional response. Don’t miss the amazing gifs by Sujoy! We also recommend this fun Madhuri interview by AIB! Don’t forget to send your screenshots and requests to upodcasting@gmail.com. Note: The Khandaan podcast is an interactive experience! Please click below to vote for the next movie you think we should feature. To Take Part in our Give Away! Farah and Shah Rukh Khan come together again after a long hiatus to give us Happy New Year which is shattering records left and right. Part Heist movie, part dance movie are they able to recreate the magic of their previous collaborationsMain Hoon Na and Om Shanti Om? Can a 6 pack actually be terrifying? Is there something like a merry go round bar dancer? Did Amir actually go “Full Retard” in the PK trailer? 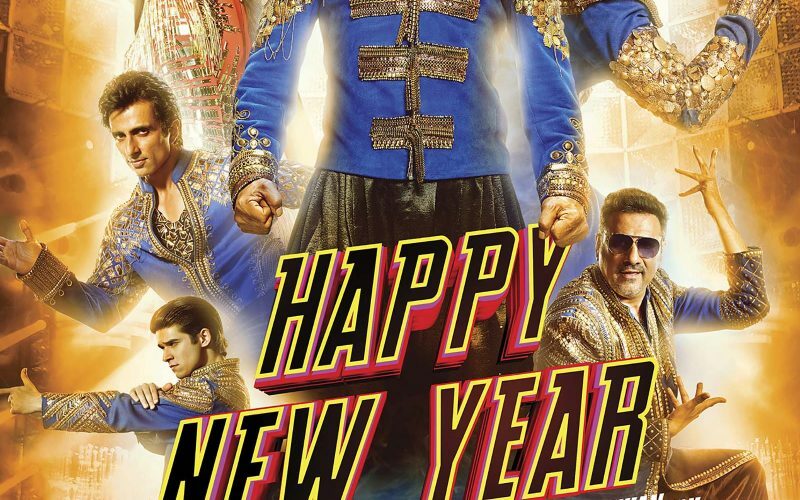 Is it fair to have expectations from a movie like Happy New Year? And does it deserve to make as much money as it did? Or do movies like Kick, Bang Bang and Dhoom 3 deserve it more? Or subscribe in iTunes and never miss a beat! Farah Khan is suddenly a little tearful – “I’ve realised the journey is coming to an end“. Watching the star studded line up at the European press conference for the upcoming Happy New Year in a Central London hotel on a crisp Sunday morning, the camaraderie and strong bond between the cast was clearly evident. And if that is in the final product, then we really do have an amazing film to look forward to. Sonu Sood claimed it was “the biggest film ever made in India” and how it had been a “life changing experience working with Farah“. For Deepika Padukone, working with Shah Rukh in a lead role for the third time came very easily to her – not only did she know his processes but also revealed how she never questions anything that Shah Rukh tells her to do. Indeed, there was plenty of SRK mania evident at the conference and being in the same room with him, it was not hard to see why. Shy and unassuming, his poise and modesty came across with sincerity, gently encouraging to the Nepali journalist who had recently learnt Hindi when she asked a question and he seemed genuinely embarrassed when a French journalist offered him a book about him written in French as a gift. It was also touching to see how he made sure all his cast members got a chance to speak. Things took quite an interesting turn when a press member suggested that the SLAM tour had allowed HNY to make all its money back before release and the rest was a money making exercise. The journalist also asked SRK what he had felt he had yet to achieve, cheekily adding on a request for SRK to reply in Hindi rather than English. SRK certainly gave a fitting reply in Hindi – explaining how a film could not guarantee it would do well at the box office and this was more a project of passion. As for his achievements, he said he wanted to give back to the audiences. It was interesting to see the superstar put on the spot and emerge with his dignity intact whilst shutting down the journalist. Indeed, the SLAM tour has proved a blessing for HNY – as SRK explained: “We used the coincidence of the live concerts and film release as promo strategy” – certainly a savvy business idea which has been well received by the fans and by the rest of the cast too; apparently, we have not heard the last of the SLAM tour which may return once more in a different form in the future. All too soon, it was time to wrap up – it seemed the cast had more fun than anyone else, encouraging and teasing one another but with the feeling that the gathered audience were also in on the joke. How the film is received on release remains to be seen but it was Farah Khan who had the last word – explaining “HNY is a festival film – it is releasing on Diwali!” – let the festivities commence! Bhushan Kumar is a film obsessed amateur fashionista who lives in London. Directed by enfant terrible of Hindi Film cinema Shirish Kunder, starring Akshay Kumar, Sonakshi Sinha, Shreyas Talpade and Alex O’Nell, follows up his 2006 gem Jaan E Mann with a Sci-fi village hoax movie Joker. Unfortunately already one of the lowest openers of the Indian Box Office of 2012 and pretty much a disappointment all round for those looking forward to what this witty director with a keen visual sense would come up with after a gap of 6 years. Our guest GetFilmy joins us to discuss the debacle leading up to the release, what went wrong and we speculate on what the next steps could be for Shirish Kunder as a film maker. We try to talk as positively about the movie as we usually do on the show and theorize what went on behind the scenes. Why did Akshay not promote the movie? Is it a completely bad movie? We finish up the show with the forthcoming releases of the year and what else we can look forward to. Apologies for our listeners that joined us on Ustream ,that was an experiment that didn’t go well…Maybe next time. You can find more of GetFilmy’s writing on her excellent blog of follow her on twitter. You can download/listen to the show below and let us know what you think about in the comment section below. Is this the original version of Character Dheela? During the promotional run of the blockbuster Ready, there were rumours circulating about introductory song Character Dheela being reshot as Salman Khan and the production company Tips weren’t really happy with the grandeur of the original version. The rumours took the usual route of first being multiplied and enlarged (allegedly director Anees Bazmee was annoyed of being side tracked and then close to walking off, then Farah Khan was being approached) , then denied and as soon as the movie became a hit, completely swept under the rug. Let us know what you think of Character Dheela in our comment section below! A lot of question surround this movie but you forget about all of that within minutes when Tees Maar Khan theme song kicks in. I’ll try my best not to spoil too much of the movie as I was fortunate enough to catch an early preview in London; but honestly speaking I could only spoil some of the comedic beats,not much of the plot. It’s a pretty straight forward masala caper and most of the set up is in the trailers. Tees Maar Khan urf Tabrez Mirza Khan ,the biggest con artist in the world, is hired to rob a train carrying an immense treasure for a set of conjoint twin â€œvillainsâ€. He also is a shameless plugger of his own name. There was maybe one too many reference to the title of the movie to my taste but all that is not important for what we get is easily one of the funniest and most entertaining entertainers of the year. It’s what Housefulll wishes it was, what Action Replayy could never accomplish and what Golmaal lies in bed at night crying it could be one day. First, I would suggest that if you have a chance, go and watch this movie on the big screen. Partly because it’s the kind of movie that is elevated with a participating audience and partly because it needs the big canvas so you can soak up all the gorgeousness in every shot. I have a pretty good media set up at home but in no way could I understand the awesomeness of Sheila Ki Jawaani until I saw it today. There were many discussions the previous weeks about which was the best item number of the year: Munni Badnaam Hui from Dabangg or Sheila Ki Jawaani.I am still not sure I have an answer for that question but what I can tell you is that there were moments in Sheila ki Jawaani that Katrina Kaif took the entire audience’s breath away. It is EPIC and if I could, I would rewind it and watch it again. You might not be able to do that in a cinema (unless you’re Raja Babu) but what you do get in the theatre experience is the full force of Vishal- Shekar‘s â€œsaaandâ€ blaring through the speakers and every minute detail of Katrina’ s performance elevating the song to a whole new level. In my opinion Katrina delivers the strongest female comedic performance since Kareena Kapoor in Jab We Met. She is hilarious in every scene as Anya Khan the wannabe Starlet/Item girl and I really hope people stop asking her to prove herself over and over again. I think she has been doing that in her recent roles and this is probably one of her bests. When reviewing our best Bollywood soundtracks of 2010 (click here) we thought that the Tees Maar Khan OST was maybe not the greatest (I am still not convinced of the Sonu Nigam’s Chipmunk voices) but it could only be fully judged when seeing it picturized. And lo and behold I was humming the songs exiting the theatre and want to get my hands on the soundtrack as soon as I can. Although Salman Khan’s cameo in Wallah Re Wallah is featured in the promos, it still manages to send a bolt of excitement through your spine. The first half of the movie just breezes by and the second half has a bit of a slower start but manages to put in a lot more heart in the movie. So now on to the Khiladi. See I’ve always been fond of Akshay Kumar (especially his work ethic and just plain sincerity) but somewhere his lovable loud mouthed buffoon shtick and those indistinguishable Priyadarshan comedies just turned me away from him. A movie that I unashamedly loved back in the day was â€œMr. and Mrs. Khiladiâ€ ,probably not the most discerning of choices, I admit but Akshay was amazing in it. That’s the kind of Akshay we get here. he is again ahead of the world, a real hero character kids would want to emulate (those fluorescent Jersey Shore Shirts can be omitted) . Someone who is witty, funny and confident. I donâ€™t know if he ad-libs some of his lines in that throw away manner but it makes me crack up everytime and actually believe in Akshay as a leading man again. Unfortunately for my non-hindi speakers the subtitles were not able to catch every joke thrown in but there are so many if you miss one you’ll surely catch the next one. But you can also just enjoy the movie just as a fun masala caper with great dances and and performances from the lead as well as the supporting cast (woohoo Avtaar Gill!!) and we even get the final sequence where the whole team apears. Akshay Khanna is hilarious as the oscar obsessed Bollywood superstar, some will claim it’s inspired by Amir or Shahrukh but I donâ€™t see it really or at least nothing to create news stories about but I’m sure that won’ stop people. There are certain moment that I did feel the ghost of Shahrukh Khan, who was rumoured as the main lead, loom over Tees Maar Khan. In some of Akshay’s hero poses, comedic repartÃ©s and even some of the choreography, you can can almost imagine what Shahrukh would have done with it. Even a few of the sets and dÃ©cors were eerily similar to Om Shanti Om. But although fun to speculate that’s just context with no real importance to the film. All in all I think this movie is a great move for Farah, Shrish Kunder and her production company in developing her Manmohan desai style even further. I am truly looking forward to her next paisa vasool flick but until then: go watch Tees Maar Khan on the big screen NOW!